After World War II, when air travel became much more affordable and family vacations in cars on newly built roads became the norm, the passenger rail industry spiraled downward in a devastatingly rapid fashion. Majestic stations and terminals were abandoned or demolished. However, many survive, and the bullet trains of Asia and the success of the Chunnel are just two indicators that rail travel is far from history and will not be relegated to merely your daily commute to work. You should be sure to check out these architectural triumphs — very often located in the heart of the city that you’ve just flown into. These are my favorites. 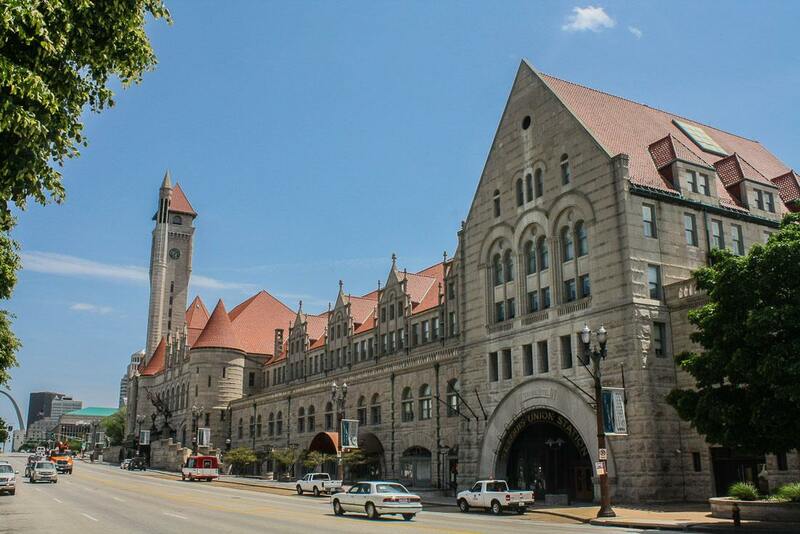 Opened in 1894 in the heart of downtown St. Louis, Union Station immediately entered the history books as the largest and busiest terminal in the world, featuring the largest single-span train shed ever constructed (covering 32 tracks and stealing that record from London’s St. Pancras). This indisputable gem emits a magnetic allure that commanded my attention every time I passed by. Combining Richardsonian and French Norman styles, this enormous station, with its red roof, fortress-like round towers, and soaring clock tower, was serving upwards of 100,000 passengers per day on 22 different railroads using 42 tracks at its peak. It chugged along until operations ceased in 1978. A restoration project completed in 1985 preserved its flawless exterior that makes you feel like you’re about to embark on something special as soon as you approach it. Now serving only the city’s light-rail transit system on just two tracks, Union Station has been repurposed as a hotel, entertainment center, restaurant and shopping complex, and Memories Museum that traces the station’s history — including its role as the spot where the famous photo of newly elected President Truman holding up the Chicago Tribune‘s very incorrect headline (“Dewey Defeats Truman”) was shot. Inside, I was completely taken by the 65-foot barrel-vaulted ceiling over the spacious Grand Hall covered in gold leaf and frescoes, and the Romanesque arches over windows and doorways. After enjoying a cool drink at the stylish bar, I made sure to admire one of the station’s highlights, the Allegorical Window — a stained-glass window depicting St. Louis as a goddess sitting regally and confidently on a long marble bench while rival goddesses New York and San Francisco rest on either side of her, eyeing her jealously. 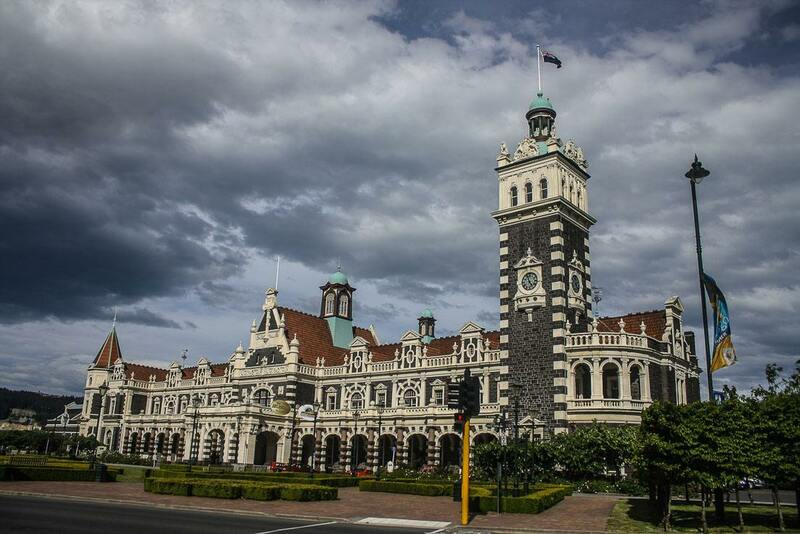 Fronting the triangular Anzac Square, the Dunedin Railway Station — once New Zealand’s busiest railway station in what was once its largest city — was completed in 1906 in a beguiling Flemish renaissance style, combining dark basalt with lighter stones, pink granite, and slate-gray terracotta shingles. A tall clock tower anchors one end of this exceptionally eye-catching and extremely long structure, and a protective colonnade runs along the front. The interior booking hall is highlighted by a floor of 750,000 mosaic tiles with locomotive and other train-related symbols. I caught the best view of it from upstairs, leaning over the rails of the balcony lined with a porcelain frieze and stained-glass windows, also containing rail motifs. Although its original purpose has been largely diminished, New Zealand’s most photographed building remains relevant by housing both the New Zealand Sports Hall of Fame and the Otago Art Society, and by hosting the South Island’s main fashion show every March, when its 1,640-foot platform is transformed into the world’s longest catwalk. Walking through the expansive plaza fronting Cincinnati’s Union Terminal gave me plenty of time to admire this Art Deco treasure. The largest manmade half-dome in the Western Hemisphere became an iconic symbol of the city as soon as it opened in 1933, but a doomed one at that. Rail travel was already starting to taper off, and the last train departed the station in 1972. 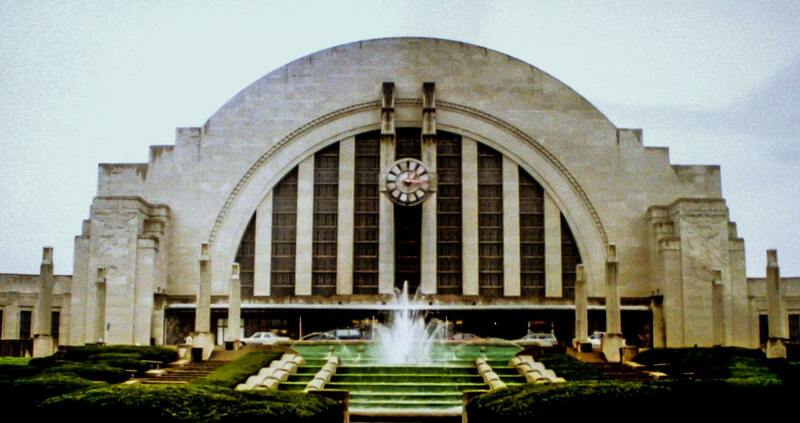 After a tumultuous few decades under the constant threat of demolition, Union Terminal has emerged as a cultural center containing three museums, a library, an Omnimax theater, and the Cincinnati Railroad Club. Limited rail service — one train, three times a week — was restored in 1991, and those lucky passengers get to walk through a striking interior, characterized by sweeping circular lines, rich woods, unmistakable Art Deco fonts in the old signage, and, especially, brilliant murals in the rotunda. At 22 feet high and 110 feet long, the murals depict the city’s history through images of everything that shaped the “Queen City” — railroads, steamships, industry, farms. Unfortunately, Union Terminal is once again at a critical juncture, having been listed as one of the 11 most endangered historic places in the United States by the National Trust for Historic Preservation in 2014 due to extensive deterioration and water damage. Hopefully, Cincinnatians will find a way to keep Union Terminal from the wrecking ball — it deserves better. 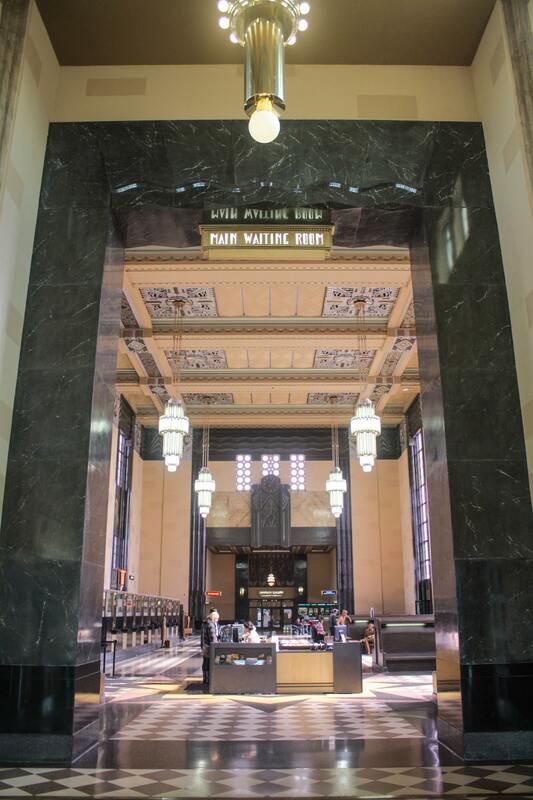 Upon first sight of the now defunct Union Station in Omaha, Nebraska, I was awed by the grandeur of this gorgeous structure, opened in 1931 as Union Pacific’s first Art Deco station. At its peak, it served up to 10,000 passengers per day on seven different railroads not only with rail service, but a 24-hour restaurant, newsstand, barbershop, telegraph office, and small hospital. During World War II, a USO canteen was set up for thousands of servicemen passing through. The station closed in 1971, and Union Pacific donated it to the city; it’s now home of the Durham Museum. The exterior is an eye-catching vocabulary of strong lines and stylized sculptures and fixtures. When I walked into the Great Hall, I was completely won over by the 60-foot-high ceiling with herringbone patterns, cathedral windows, chandeliers that weigh more than 2,000 pounds each, brass ticket windows, terrazzo floor with three large sunbursts, statues in period dress buying tickets or waiting on the high-back wood benches (that had both lighting installed at the top, and the heating system built into them, with the vents at the ends) or hurrying through the doors to board their train, and the giant birds on either side of two clocks, stylized with zigzags, squares, and lines. After taking it all in, I couldn’t resist sitting at the counter of the soda fountain, slurping an old-fashioned chocolate milk shake and watching the staff set up tables, chairs, and floral arrangements for a wedding later that evening. Of all the train stations I have passed through, Helsinki’s muscular and perfectly functional and comfortable Central Railway Station is the one I had wanted to see most. Finland’s most visited building is traversed by 200,000 passengers per day. Opened in 1919, it is one of the most recognizable buildings in the country, an Art Nouveau masterpiece of pink granite, copper roofs turned green, and a formidable clock tower. The main entrance rests under a huge arch-shaped wall featuring a series of stepped arches, giving it additional depth and framing the large grid-patterned window perfectly. 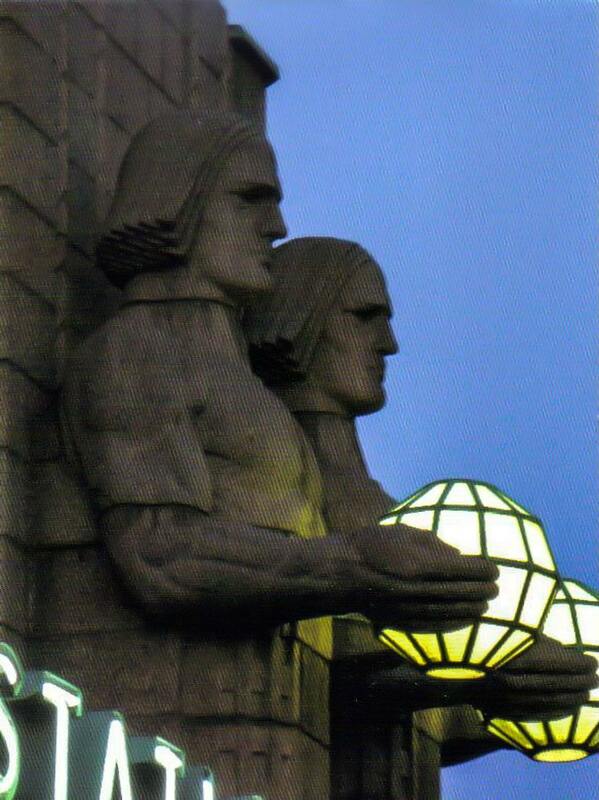 On either side of the entrance stand the building’s signature elements: two pairs of towering male figures, with highly developed arms and torsos but completely formless bodies below the waist, like extended busts atop tall pedestals. Each figure gently holds a spherical lantern that is illuminated at night. Inside, a handsome arch in the ticket hall complements the one I had just walked through. The green tile and subtle flora motif of the pillars lead up to a vaulted ceiling. Somewhere else in the building, in a space not readily disclosed to the public, a lounge is reserved for the Finnish president, possibly the only such amenity in the world. It took me a barely a minute in architect Eliel Saarinen’s pièce de résistance to understand why it was selected as one of the most beautiful train stations in the world by the BBC in 2013. Very informative! Thanks for this post! Thanks, Bel. Glad you enjoyed it!